Few things are more ephemeral than a view of the night sky. But artist Daniel Owen Stephens (1893-1937) built his career on capturing dramatic starscapes as the eye perceives them from Earth. This Saturday, September 27, Vermonters can get a close-up look at the work of the “astronomy artist” whose work has hung in New York’s Hayden Planetarium. Chris Hislop of Williamstown organized “The Heavens on Earth,” a daylong exhibition of seven 5-foot panels by Stephens, as a fundraiser for the historic Washington Unitarian Universalist Church. Built circa 1850 and refurbished in the 1890s with local fir paneling, the church needs re-roofing; organizers hope to raise enough to qualify for a matching grant of $8150 from the Vermont Division for Historic Preservation. Loring Starr, Stephens’ granddaughter, recently saw the church for the first time at her friend Hislop’s request: “The interior is absolutely extraordinary. It’s all this beautiful, glowing wood,” she says. Starr resides in East Montpelier, as do her mother and aunt, Barbara Stephens Starr and Joyce Rhodes, who have preserved “about a dozen of [Stephens’] paintings, some of his books, and the panel sketches,” says Starr. The oil panels to be displayed at the church are sketches for much larger paintings that were originally intended for the University of Pittsburgh’s Cathedral of Learning. They’re detailed, striking allegories, a bit reminiscent of William Blake’s engravings, representing the progress of human knowledge in various fields. Stephens filled his backgrounds with inky skies and stunning streaks and splashes of the Milky Way. 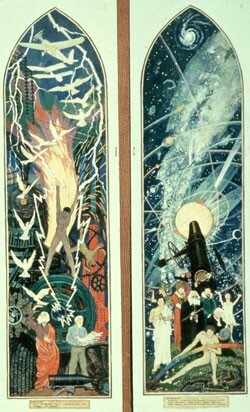 In much of his work, those stars became the foreground. On June 8, 1937, Stephens went 14,600 feet up into the Andes to record a historic total solar eclipse with accuracy unattainable by the era’s photographic technology. In just 202 seconds, he produced sketches that became the basis for canvasses reproduced in Life magazine and elsewhere. The voyage that made the artist famous was his final one, however: On the way home, he suffered a fatal paralytic stroke, attributed by doctors to his work at high altitude. Stephens' two Vermonter daughters will be at the Washington church to discuss his work and legacy during the exhibit, from 11 a.m. to 4 p.m. Friends of the church will serve refreshments and solicit donations for the Reginald E. Webster Memorial Roof Campaign, which may also be sent c/o Arthur Stukey, Treasurer, 120 College Street, Montpelier, VT 05602. Info, 229-0007.